To my knowledge, this was the first ever event of its kind for all USG exchange alumni – not just Fulbrighters or VEF alumni. I’ve been around awhile but I’m not all-knowing, so corrections and clarifications are welcome. 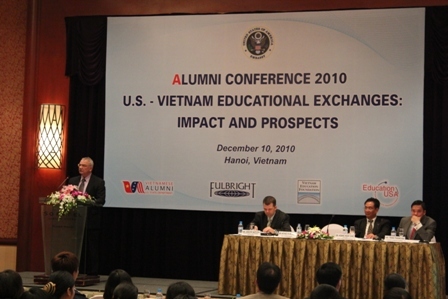 The only alumni conference for all US-educated Vietnamese of which I’m aware is one I helped to organize in July 2009 when I was country director of the Institute of International Education-Vietnam. There’s an article entitled First Annual EducationUSA Alumni Conference held in HCMC (PDF) on p. 11 of the March 2010 issue of Vietnamese State Alumni Newsletter that includes some unattributed quotes from my opening remarks. Below are the agenda and session descriptions from US-Vietnam Educational Exchanges: Impact and Prospects. 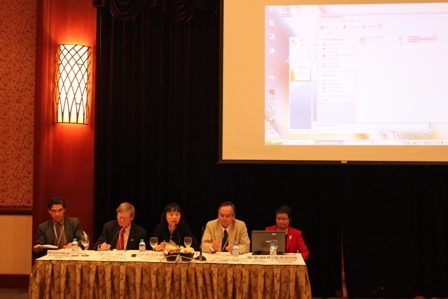 09:00 – 10:00: Opening and Plenary Session: Included Ambassador Michael Michalak, Dr. Hoang Ngoc Giao, Vice Director, Institute of Policy, Law and Development, Mr. Trinh Thanh Hai, Independent Management Consultant, and David Moyer, Assistant Public Affairs Officer, US Embassy Hanoi. Designed for students, scholars and professionals who are interested in studying, doing research and participating in a U.S. Government professional exchange in the U.S. Program officers from the U.S. Embassy, the Fulbright Program, EducationUSA and Vietnam Education Foundation will introduce a wide range of scholarship opportunities as well as their application processes. Designed for alumni and the public who are interested in learning about benefits of U.S. Government funded exchange programs for students and professionals. A panel of alumni from diverse background will discuss how their respective programs have changed their professional and personal lives. Designed for scholars who are interested in doing research in the U.S. and for educational institutions who are interested in hosting American scholars. A panel of both American and Vietnamese scholars will discuss how US-Vietnam scholar exchange can support education development efforts in Vietnam. Designed for Fulbright alumni and prospective candidates. A panel of Fulbright alumni will discuss various networking opportunities among Fulbright returnees, how they can build on their Fulbright experience through mentoring, partnership and community service. This conference was one of Ambassador Michalak’s last education-related events. Those of us who have had the pleasure of working with Mike Michalak wish him all the best in the next chapter of his professional life. Unlike some other ambassadors I have known, Ambassador Michalak was open, friendly, down-to-earth, and had a sense of humor that served him well. He connected with the Vietnamese people, the supreme compliment for any diplomat. Chúc sức khỏe! Cheers! 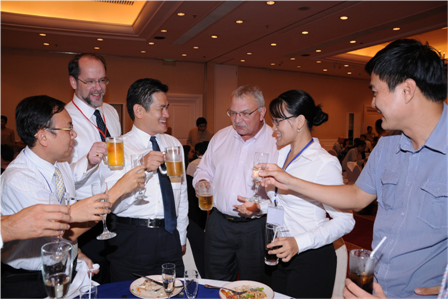 Toasting with several generations of US-educated Vietnamese at the 1st alumni conference in July 2009 in HCMC.